How Much “County” in Washtenaw County-wide Transit? Councilmember Christopher Taylor, who never hesitates to be lawyerly. He began reading pre-agreed amendments. But the main action of the night belonged to the public, who expressed many views and raised many points, for, against, or simply qualifying the proposed agreement. What almost all of them had in common is that they referred to it as supporting a “county-wide transit plan”. Indeed, “county-wide transit” has been the shorthand way to refer to the Transit Master Plan from the beginning (the website for Moving You Forward speaks of “going countywide”). But just how county-wide is it? As we detailed in our post AATA: Moving Us Where? The Big Picture, the process toward “County-wide” began by signing up all the municipalities outside of Ann Arbor and the City of Ypsilanti to Act 7 (Urban Cooperation Act) “interlocal” agreements. This produced a district arrangement based on population and also monetary contribution (Ann Arbor and Ypsilanti get more representatives because of their millages). Note that Washtenaw County has 20 townships, and is usually said to have 26 municipalities. Taking Dexter (village, soon to be city), Manchester (village), and the cities of Ypsilanti, Chelsea, Saline, and Milan into account, this only works if you don’t count Barton Village, or the city of Ann Arbor either. But of the 20 townships, 4 (or is it 5?) declined to participate in the Act 7 agreements, thus have not been included in the “u196 board” of tentative representatives from the various districts. There is some confusion about just which townships have declined to participate. Though both we and the Ann Arbor Chronicle reported last fall that the abstainers were Lyndon, Sylvan, Bridgewater, and Salem Townships, more recently AATA staff and a map used to illustrate districts have indicated that Lyndon is in and Saline Township is out. But how realistic is it to suppose that there will be no more opt-outs? As we detailed in our post, AATA: Moving Us Where? The Politics, many of the small rural townships are very tax-averse and some have trouble even passing millages for police protection. It seems very likely that they will, when faced with an actual possibility of being asked to contribute additional property tax, opt out. 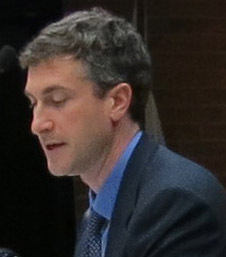 CM Stephen Kunselman, in speaking to the Board of Commissioners, pointed out that these low-population townships could fear that the greater population of Ann Arbor and Ypsilanti would approve a tax even if they voted against it, thus would be likely to pull out. As reported by the Ann Arbor Chronicle at that same meeting, Commissioner Alicia Ping stated that except for “one mayor and one township supervisor”, there was no interest in her Southwest Washtenaw county district in joining the authority. In what I have called an “optimistic” scenario, Manchester Township (with its village) and Dexter Township (a progressive township influenced by both the city of Chelsea and Dexter Village), remain in, as do populous townships like Pittsfield and Ypsilanti. Superior has an urban population in its southern portion and Northfield is somewhat urbanized, with its own DDA. Scio has urbanized areas and would benefit from better transit into neighboring Ann Arbor. Most cities and villages (other than Milan, at the edge of the county and half in a different county) are included. The TV of these combined communities, though they represent the greater share of taxpaying property in the county, a one-mill tax would yield only $10,764,977. But suppose that this optimism is unfounded and only the townships in the immediate urban and urbanizing area (plus the major cities) remain in the authority’s area? Scio Township in particular has succeeded in keeping its tax rate very low and discontinued its POSA that provided a minimal bus service along Jackson Avenue (an event poignantly captured by Julie Steiner of the Washtenaw Housing Alliance, who described mothers forced to walk for miles in the snow carrying their infants after the bus service to the Alpha House family shelter on Jackson was discontinued.) Scio and the remainder of the western townships might well pull out (Manchester Village and Dexter Village would likely have to go along with the townships in which they are embedded), leaving only the cities and the remainder of urbanizing townships. But Ypsilanti Township is under financial stress. Though many of their residents are low-income, much of the population is rather diffuse and it could well be that the benefits of increased transit availability would not prove to be a sufficient incentive to expose themselves to a further tax increase (they’ve had to go to their voters for several lately). This would lead to a millage yield of only $8,059,123. Yet even this pessimistic scenario may not be realized. There could be a contagion effect (township leaders talk with each other on a regular basis) so that only Pittsfield Township (which has a large POSA currently and is well integrated into the bus system), and the cities of Saline and Ypsilanti join the city of Ann Arbor in the authority. Saline’s mayor, Gretchen Driskell, has been strongly supportive of the plan and Ypsilanti’s mayor, Paul Schreiber, appeared at the public hearing to say that the plan would “stabilize” Ypsilanti’s bus service. Ann Arbor Township is not currently served by bus service (and does not contribute to the recent extension into its area for UM medical facilities). The Village of Barton Hills, a wealthy enclave without public roads, would likely lobby strongly about being exposed to an additional tax. So it is entirely possible that a newly formed 196 authority would be composed of only 4 municipalities, including the city of Ann Arbor. Under this “minimal” scenario, only $6,606,568 would be raised from a 1-mill tax, half of what is needed to make up a $12 million annual budget gap. Of that amount, two-thirds ($4,422,578) would be the new tax paid from Ann Arbor (separate from the existing $9 million collected already). Obviously, these predictions (really, guesses) will be emphatically rejected by proponents of “countywide transit”. But how could we determine which scenario is most likely? One way would be to conduct a survey. Ah, yes – there was a county survey done in 2009. According to the executive summary of that survey, support for a new tax to support countywide transit was in the majority (51%) but that was deemed too “soft” to guarantee success, since only 17% said they would “definitely” vote for such a measure and 34% said they would “probably” vote for it. The survey was designed with four different sampling areas in the county, but the only geographic information in the summary was that Ann Arbor voters were more likely to say that they would support the tax. The broad countywide opinion is interesting, but we would need to know more about localized opinion, since the ability to “opt out” magnifies local differences and a small number of vocal people in a particular township could tilt the balance toward a wait-and-see, opt out now and rethink later position. But wait! 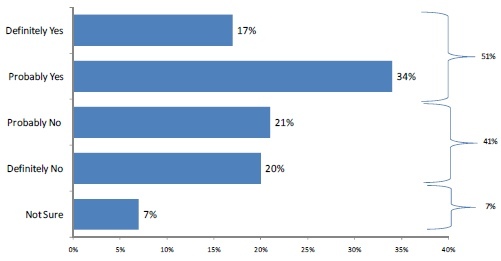 A new survey has been conducted by the AATA. (See the draft questionnaire here.) It has all the right questions to find out support for the plan (it also asks about a 1 mill tax, but does not bring up the complicated question of “opting out”. The survey was underway last fall, as reported at a committee meeting and by commenters to AnnArbor.com. But the results have not been released. When we inquired about when they may be released, the answer was “perhaps in March”. It would be useful to know what they are before proceeding with formation of a new transit authority. What About Those Interlocal (Act 7) Agreements? So what is this Act 7? It is titled Urban Cooperation Act (P.A. 7 of 1967). It is a means for different units of government to join forces for specific purposes, often either contributing or raising funds (taxes, fees). For example, Washtenaw County entered into an interlocal agreement with a number of other SE Michigan communities to promote renewable energy and energy efficiency. Since much of the Act focuses on how funds are raised and spent, it also has extensive provisions for parliamentary requirements (public hearings, resolutions, public referendums to object to the agreement, how to withdraw from the agreement, etc.). One of them is a filing requirement. authority, the remaining communities may select another representative and the opt out shall be considered a for-cause removal. The Act 7 agreements being executed within the Transit Master Plan and Act 196 process are not, then, binding commitments to the plan in any way, but merely an agreement to send representatives to the unincorporated 196 “board”. But many of these limited agreements have not been completed, and none of them have been filed. Calls to representative townships yielded mixed results. The Southeast District (Ypsilanti Township and Augusta Township) has an executed and signed agreement, as does the North Middle (called the North Central by AATA). A call to Superior Township today (January 27) resulted in Supervisor Bill McFarlane stating that staff had just this morning contacted the township and was endeavoring to get signatures for the Northeast District; otherwise they had not seen a completed agreement. Dexter Township’s clerk Harley Rider explained that though Dexter Township had conducted public hearings and passed a resolution supporting the West District agreement, he had never seen a completed agreement and didn’t know what other communities would be in or out. York Township’s clerk, Helen Neill, had a similar story; they had not received or signed a final copy of the agreement and didn’t know who else was in the South Central District. Inquiries at the Michigan Secretary of State revealed that none of the Washtenaw County TMP Act 7 agreements had been filed with the Secretary of State as required (of course, only two of five were complete). It must be concluded, to put it gently, that AATA has been very casual about a process that has been used to justify the existence of an unappointed board (the u196 board), who are supposedly being given the responsibility of reviewing the final service plan and final financial plan. Some of this may be the influence of its board chairman. During a staff briefing on the process in the summer of 2011, Bernstein grew impatient with the discussion of Act 7 agreements and blurted out, “Can’t we just get some people around a table?” It is now understandable that AATA CEO Michael Ford becomes uncharacteristically silent and looks confused when asked which townships are in or out. In any case, even were these Act 7 agreements executed and filed properly, they do not entail any long-term commitment. As Bill McFarlane said today, it seemed sensible to participate and get more information, then make the decision later with that information in hand. But they are not particularly predictive, except in the negative, of future participation in an actual new authority with the power to tax. So what would the consequences be if the new Act 196 authority were to be instituted? For one thing, Ann Arbor and Ypsilanti residents might be subject to new taxes without much expanded countywide service. The new authority would be less accountable to Ann Arbor taxpayers. Another unforeseen and hard to predict effect might come from the establishment of a SE Michigan Regional Transit Authority (see updated discussion from the Ann Arbor Chronicle), if our local authority merely became a contractor for the RTA – what part of the county would it serve and what role would Ann Arbor taxes have in that? A new geographically limited authority would lose POSA income from some communities (depending on whether they are in or out) though it could also contract with other Washtenaw County communities to offer POSA-type services. It could continue to operate some of the “out-county” services as AATA is doing now, through a series of contracts with various state agencies. But how would it manage to operate commuter express buses, or any more general county-wide network? Would it be by simply using Ann Arbor’s millage, as is already being done, without the charter restrictions that it now faces? CM Stephen Kunselman somewhat anticipated the problem with his (successful) amendment that would render Ann Arbor’s participation in a new authority that consisted only of the city of Ann Arbor null and void. But I wish that Council would give some consideration to how well a geographically limited Act 196 authority would serve the city it is supposed to represent, and at a minimum wait until all the Act 7 agreements, as slender as they are, are executed. And until the Finance Task Force finishes or at least drafts their report (today’s meeting was postponed until further notice; here is the Chronicle’s account and that on AnnArbor.com). And until we can get a little better sense how the new state legislation is likely to affect both the AATA and Washtenaw County in general ( the Ann Arbor Chronicle). And please, could we get a look at that latest survey? It might tell us something we need to know. Note: Many posts on the topic of the Washtenaw County Transit Master Plan can be found on our Transportation Page. UPDATE: An email from the Lyndon Township office manager states that Lyndon Township is “at this stage” participating in the countywide process, and the Western District representative (Bob Mester) is a Lyndon Township trustee. SECOND UPDATE: I began the search for the Act 7 agreements with a FOIA to AATA exec Michael Ford sent on January 24, 2012. After this post was originally published, I sent a supplementary FOIA (February 10) asking for copies of supporting township resolutions (I had already established that most of the Act 7 agreements did not exist). I received a response on February 14 which assured me that the Act 7 agreements had now been executed and filed with the Secretary of State. I have not independently investigated this assurance, but for now I am taking it as factual. The response came with attached, signed agreements for all Act 7 districts but did not include as attachments the resolutions from Pittsfield Township and Ypsilanti township. I have also not received copies of the other individual townships’ resolutions, which was the actual subject of this FOIA. This account informed us that Sharon Township has declined to participate, though Lyndon Township did. Apparently Barton Hills Village was never consulted, though Ann Arbor Township signed an agreement. This could be significant in terms of votes and funding for an eventual millage, since Barton Hills Village (which has only private roads and would probably never use a bus service) is some of the highest valued real estate in the county. So we need to redraw the map of who’s in and who’s out at this stage. Of the 27 municipalities in the county, 5 townships and Barton Hills Village are apparently not participating. So if you count the Cities of Ann Arbor and Ypsilanti as participating (at least at the talk stage), 21 of the 27 are engaged in the countywide transit process. 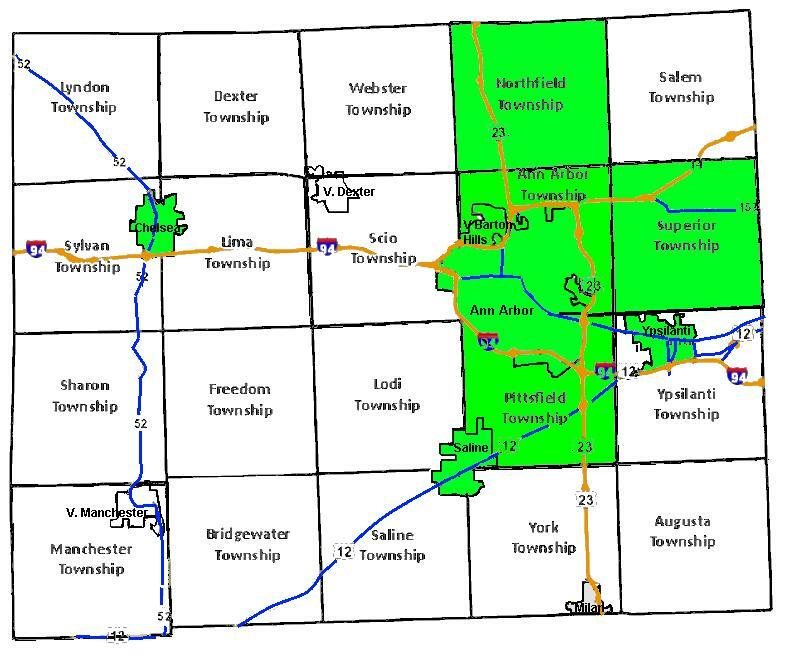 FOURTH UPDATE: Northfield Township’s Board acted to withdraw from the u196 structure (their Act 7 group) on May 8, 2012. That means that 6 of Washtenaw County’s 20 townships have now declined to participate. This entry was posted on January 27, 2012 at 9:17 pm and is filed under civic finance, politics, Transportation. You can subscribe via RSS 2.0 feed to this post's comments. You can comment below, or link to this permanent URL from your own site.